CTD profile data are presented from the VIVALDI '91 cruises Charles Darwin 58 and 59, as reported by Pollard et al. (1991). The data collection and calibration procedures have been described by Griffiths et al. (1992). The CTD profiles were taken with a Neil Brown Systems MkIIIb CTD mounted beneath a bottle rosette. The CTD was fitted with a pressure sensor, conductivity cell, platinum resistance thermometer, a dissolved oxygen sensor, a Chelsea Instruments fluorometer, a Sea Tech 100cm path transmissometer and an IOS 10kHz pinger. A total of 19 stations were occupied during CD58 (11v01 - 11v19) and 21 stations during CD59 (12v01 - 12v21) using the MkIIIb CTD. The first 2 stations of CD58 were equipment test stations not on the Vivaldi grid and the data have not been passed on to BODC. 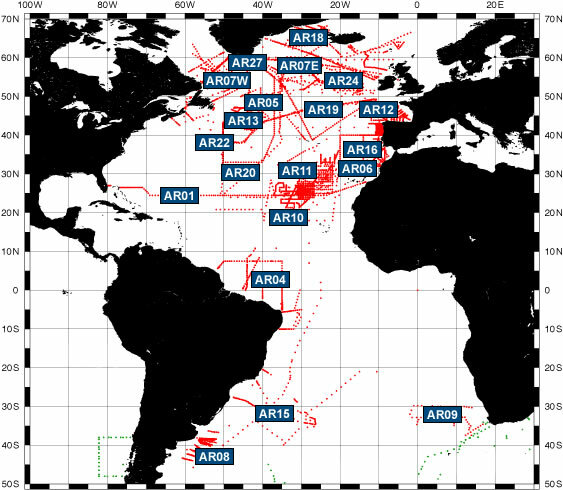 During CD59 a Neil Brown MkV CTD was also used at 3 of the stations (12v12 - not 12v11 as sometimes reported in the cruise report, 12v16 and 12v17), but these data were not forwarded to BODC and are not reported here. The 1 second data passed to the Level C were converted to Pstar format and initially calibrated with coefficients from laboratory calibrations. The up cast data were extracted for merging with the bottle firing codes, on time, thus the CTD variables were reconciled with the bottle samples. Final calibrations were applied using the sample bottle data. The data were worked up to WOCE standards by the data originators before being supplied to BODC. Although an oxygen sensor was fitted to the CTD, the data originators considered that these data were not to WOCE standards. Subsequently, the data are not reported here and are not stored by BODC. The CTD data were received as 1Hz pressure sorted down cast data. Parameters were pressure (dbar), temperature (°C), salinity (psu), chlorophyll-a (mg/m3) and potential attenuance (/m). Spikes in the data were manually flagged 'suspect' by modification of the associated quality control flag. In this way none of the original data values were edited or deleted during quality control. These data from the VIVALDI '91 cruises required little flagging and just a few points were set suspect. Chlorophyll was all null in profile 12v13. Once screened, the CTD data were loaded into a database under the Oracle relational database management system. The start time is the CTD deployment time, and the end time is the time the CTD was removed from the water. Actually these times are more precisely the start and end of data logging. Latitude and longitude are the mean positions between the start and end times calculated from the master navigation in the binary merged file. Griffiths, G. et al. (1992). CTD oxygen, tracer and nutrient data from RRS Charles Darwin Cruises 58/59 in the NE Atlantic as part of Vivaldi '91. Institute of Oceanographic Sciences Deacon Laboratory, Report No. 296, 52pp. Pollard, R.T. et al. (1991). RRS Charles Darwin Cruises 58 & 59. Institute of Oceanographic Sciences Deacon Laboratory, Cruise Report No. 228, 49pp. Please note: the supplied parameters may not have been sampled from all the bottle firings described in the table above. Cross-match the Sample Reference Number above against the SAMPRFNM value in the data file to identify the relevant metadata.